So does this mean Kogi in NYC is dead? 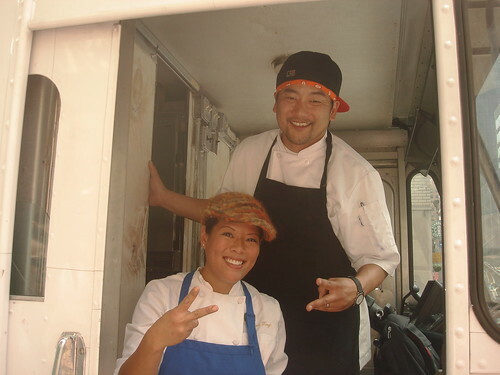 Kogi’s Chef Roy Choi had this to say: “I love NYC! We are doing our best but my energies right now are trying to keep the food fresh to def! 55th and Lex….it will go down in history :)” History? That doesn’t sound too promising. Could Baja Fresh be our best chance of getting “Kogi” to NYC? Natasha Phan, director of business development for the Kogi BBQ truck in Los Angeles, said she wasn’t aware of Baja Fresh’s test of a Korean taco until recently. She declined to comment on any potential trademark concerns. “Our only comment is that we’re focusing on building and strengthening our core business,” she said. Posted by Zach Brooks at 8:00 am, July 17th, 2009 under Baja Fresh, Kogi BBQ Truck. “Trademark concerns”? You can’t raise a trademark issue unless you actually have a tm. And with “kogi” and “taco” being generic food descriptors, no one is going to get a trademark on “kogi tacos” nor prevent anyone else from using that as a food item name. The concept of a “Korean taco” is even less protectable. Happy Well Being cart should come back to Midtown…better than ever with their own line of korean-style tacos. I doubt they could do any worse. Bring back Happy! In any case… I actually like the korean taco place on st. marks… (although not a midtown lunch).. and when I crave Korea tacos.. i usually go there, or just make it at home… i wonder if i can quit my day job and start selling korean tacos..
Did he really say “fresh to def”? It’s a slang term if you’re a rapper from 1992. Forgive me for a second here, but what exactly was the point of the Dessert Truck/Kogi Truck promotion then? To drum up support for something we can’t have? That wanted ny to know there were fresh to def.